People in the Valley like to honor their sports teams. It is a point that has been driven home again and again, an issue that all Phoenix area residents tend to come together on. Mayor of Glendale Jerry Weiers is hoping that his constituents will agree with him that they should honor the Arizona Cardinals by renaming a section of Bethany Home Road to pay homage to arguably Arizona’s most popular sports team. 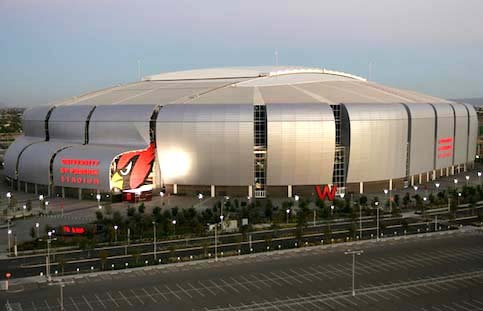 The Cardinals have been in Arizona for 30 years, making their home in the Phoenix area. When they first moved here in 1988, they were known as the Phoenix Cardinals, changing their names to Arizona Cardinals in 1994. The Cardinals may have moved in their tenure, but are the oldest longest running professional football team in the country, first being created in 1898. They quickly won the favor of Arizona football fans, and are often one of the most successful teams in the NFL. They are popular and successful enough that they win television coverage all over the country, and bring a lot of notoriety to the state, which is why Mayor Weiers is stating he is putting forward this proposed name change. As a way to honor and thank the franchise, he proposes changing the stretch of Bethany Home Road located in front of University of Phoenix stadium – specifically between 83rd and 99th Avenues – to Cardinal Way. Weiers has stressed that this would be an actual name change, and not just an Honorary tittle for the road. He thinks that this is a nice way to acknowledge the attributes the team has brought to the area, from all of the NFL coverage, to games like the Fiesta Bowl, Super Bowls and more. The cost associated with this name change is in the signage, and it would run up to a total of $80,000. The Arizona Department of Transportation would handle the cost for the 12 signs that would be replaced on Loop 101, totaling $75,000 of that, leaving the remaining $5,000 to replace 5 street signs along Bethany Home Road starting at 83rd Avenue and ending with 91st Avenue. Councilwoman Joyce Clark – who represents the district housing this part of Bethany Home Road – has not really stated a public opinion on this, leaving the polls open to her constitutes and stating she is open to the idea of the change. Clark is firm on not being stuck with the full price tag for it to happen, and would want more discussion before agreeing to anything. There is a meeting scheduled for this week to have a presentation and interest gauge of council members to see if there is enough support to pursue the matter further. Glendale has honored a sports team with this honor before, renaming a street in honor of the Arizona Coyotes to Coyote Boulevard within the neighborhood of Westgate.